39. Scafati, Villa rustica in fondo Aquino, contrada Acquavitrara. Excavated 1925 and 1927 and reburied. Villa rustica found on the fondo of Tommaso Aquino fu Michelangelo, in contrada Acquavitrara, in the commune of Scafati, almost at the border of the commune towards Poggiomarino. It was excavated 1925 and 1927 and then reburied. It was found during the digging of two trenches for the extraction of lapilli, the major one in January 1925 and a smaller one in January 1927. It was at a depth of 5m from the current cultivation level. 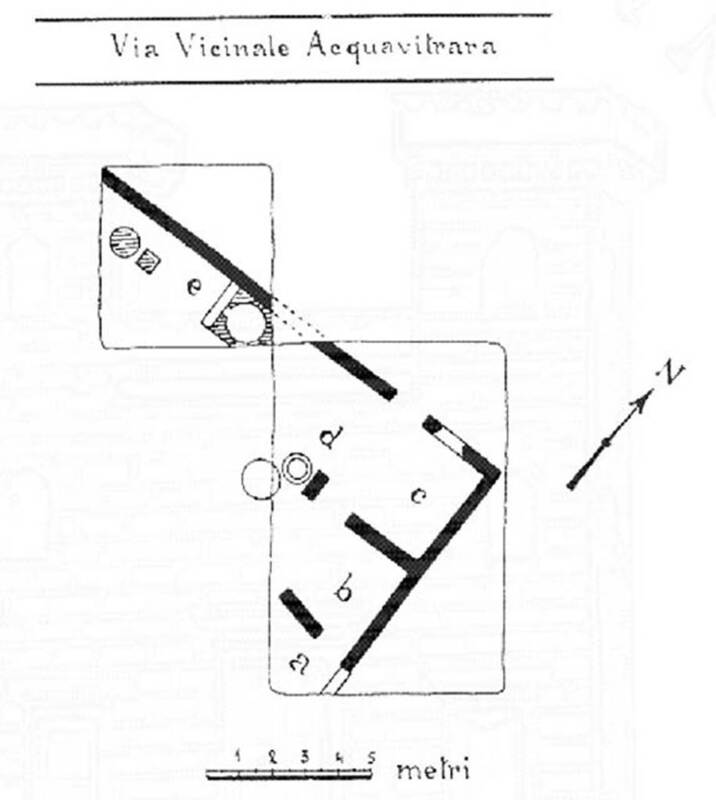 The two discoveries were parts of the north-west corner of the same villa. Notizie degli Scavi di Antichità, 1928, pp. 375-377. Casale A., Bianco A., Primo contributo alla topografia del suburbio pompeiano: Supplemento al n. 15 di ANTIQUA ottobre-dicembre 1979, 147, p.50. Day, J., 1932. Agriculture in the life of Pompeii: Yale Classical Studies, 3, tav. C, n. 43. Rostovzev, M., 1973. Storia economica e sociale dell'Impero romano, Firenze, 5° ediz., p. 34, note 26, n. 37. Villa 39. Scafati, Villa rustica in fondo Aquino. 1928 Plan. See Notizie degli Scavi di Antichità, 1928, p. 376, fig. 1. The masonry, 0.45m width, was in opus incertum with pieces of Sarno stone (mostly) and volcanic lava. Brick material was generally used in the passage openings and also and the opening in the dome of the oven, as in the low and wide circular podium and the room “e”. The walls, except some places covered with rough brick plaster, were bare. The floors were simple beaten earth, except in “c”, where the floor was cocciopesto. Of the two entrances from the outside into “a” and “c”, one had a threshold of Vesuvian stone, the other of wood, according to the clear imprint remaining in the ground. The circular puteal “d” was masonry, covered with brick plaster and closed with a lid of a clay dolia, from the underlying tank. By it, set in the ground to function as a reservoir, was the bottom of a big dolium. In “a”, was found the skeleton of a goat with a collar with a bronze bell, 0.07m high, 0.045m wide, with a circular aperture, adorned with three circular striations at the base of the suspending ring. A fragment ... lis fe .....,. See Notizie degli Scavi di Antichità, 1928, p. 377.